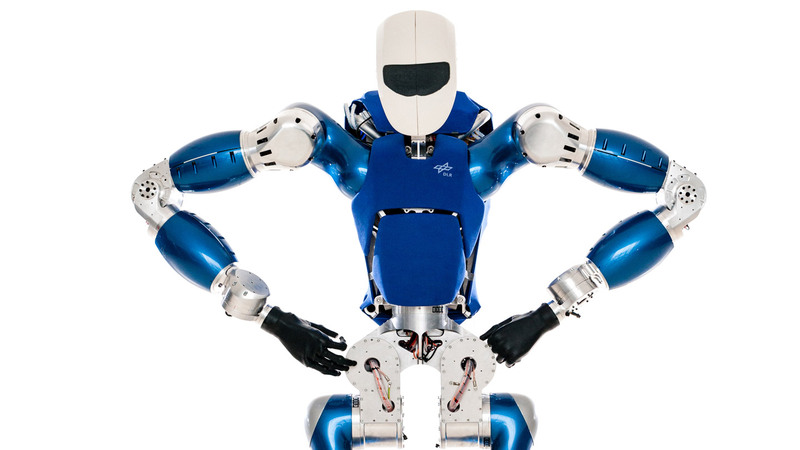 With its arms and hands, the German Aerospace Center's (Deutsches Zentrum für Luft- und Raumfahrt; DLR) TORO robot can perform tasks such as opening doors. 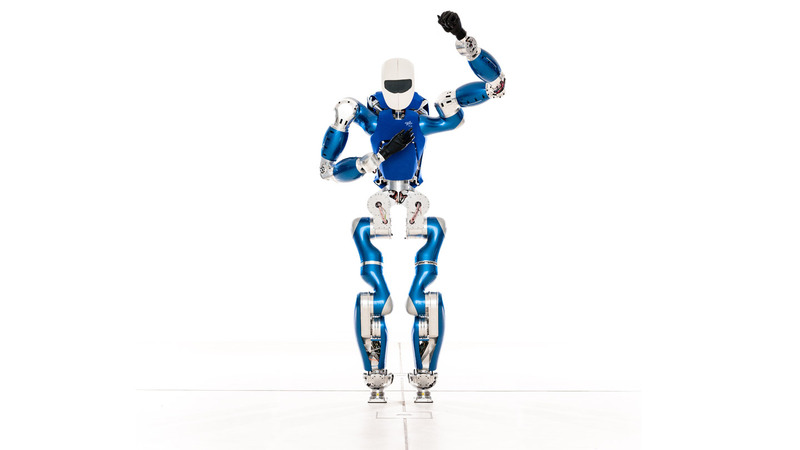 The German Aerospace Center's (Deutsches Zentrum für Luft- und Raumfahrt; DLR) TORO robot began as a walking machine – just legs with a camera. With an upper body, arms and hands, TORO is now complete. Engineers at the German Aerospace Center (Deutsches Zentrum für Luft- und Raumfahrt; DLR) are using TORO to conduct research into robots that respond to their surroundings and can move safely in an unknown environment. It began in the summer of 2009, with two legs and a camera mounted on top – but it was still far from being a robot of humanoid appearance. Gradually, the TOrque controlled humanoid RObot (TORO), the German Aerospace Center's (Deutsches Zentrum für Luft- und Raumfahrt; DLR) walking machine, has become more human-like – an upper body, a head with camera eyes and arms have been added. TORO is now complete, with forearms and hands with sensors and flexible joints that allow it to respond to its environment with exceptional sensitivity. TORO must now learn, step by step, how to perform simple human actions – climbing stairs or opening doors, for example. "Now that the robotic body is complete, we can test processes where the robot carries out sequences of movements with foresight and fluency," explains Project Manager Christian Ott. Being a walking machine, there is one thing that TORO can, of course, do well – walk. The robot smoothly sets one foot down after the other and moves forwards in small steps. Although the speed is not great, with every step TORO detects the forces at work via sensors in its feet. Torque sensors in the joints ensure that the robot reacts flexibly to its environment. When the walking machine is standing still, it can compensate for impacts against its legs. TORO even manages to do this on a tilt board. "We are working on making it function even better when walking," says Ott. TORO does this with remarkably small feet. This is a difficult obstacle that the scientists have chosen for themselves. "On the one hand, we wanted to make it more difficult by using a small footprint, but on the other, it enables the robot to climb over obstacles more easily." The inclusion of an upper body and arms has added another challenge. For the researchers, the walking machine is not merely a robot that is expected to learn and master specific tasks; it is a testing ground for all the technology required. While other robots are primarily expected to move around a known environment in a programmed way, researchers want TORO to develop other talents. Above all, they expect to prove its ability to operate independently, flexibly and safely in a new, unknown environment. 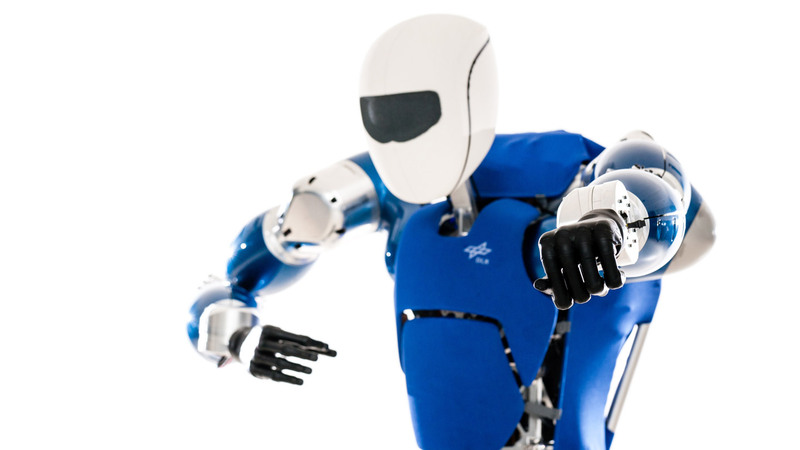 To do this, the researchers at the DLR Institute of Robotics and Mechatronics are drawing on knowledge they already have; TORO's arms and legs are based on DLR's lightweight robots, which are already being used in car manufacturing. These, too, are fitted with sensors and react flexibly to any external disturbances. The researchers chose particularly powerful motors for the walking machine's legs. The motors for the arms needed to be somewhat less powerful. In terms of TORO's appearance, this means powerful legs and thinner arms. With its arms and hands, TORO will now move on to the next phase of development, in which the interaction with the environment will be even greater. "If a person opens a heavy door, for example, they do so in a dynamic process," says Christian Ott. "They know subconsciously which moves must be performed. Our robot should be able to do this as well." When do you apply pressure to open the door? When do you ease back? How do you position your upper body? For humans, this knowledge is intuitive. TORO needs to follow this example. In the torso, an inclination sensor records the acceleration and speed of rotation, for example. "Another goal is to climb stairs. This involves TORO learning how to pull itself up on a handrail like a human." The walking machine's first hands are being kept simple for this; they can grip, but not move as dextrously as the high-precision hands of DLR's SpaceJustin, for example, which can open containers and pick up glasses on its own. "The work on TORO is an on-going process," comments Christian Ott. "This is not intended to create a perfect walking robot, but to be a continuous source of new knowledge."